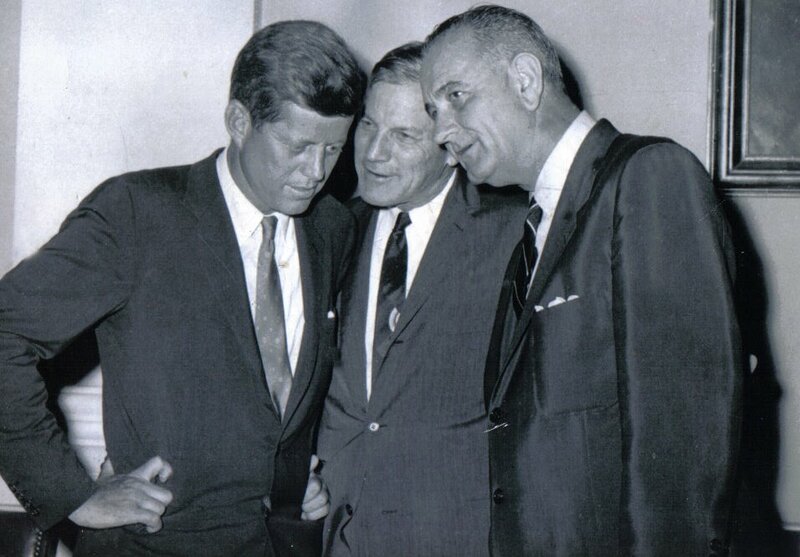 His buddies, John F. Kennedy and Lyndon Johnson, are on either side of my Uncle Porter in the photo. Uncle Porter is smiling the sly grin embedded in my heart, his arms around the other two, who are leaning in close, perhaps to catch one of the pearls of country wisdom he regularly doled out or – more likely – waiting for the punch line of a good joke. The photo was sent a few years ago by his daughter Lynn, who had made copies for her cousins; it occupies a prominent spot on my refrigerator door. It is pure Porter Hardy, Jr. In those days he was a U.S. Representative, Virginia gentleman, country farmer and my favorite uncle. But I missed his funeral. He knew this in advance. I had moved to San Francisco toward the end of Uncle Porter’s life, a long way from his home in Virginia Beach but really not a difficult trip in those pre-9/11 days of air travel. Uncle Porter had escaped one brush with death a few years earlier – he was a heavy smoker for many long years – but had reached a point at which his lungs and his life were fast coming to an end. My sisters and I, along with other family members, were talking about making arrangements for the funeral, which seemed likely to be soon. I picked up the phone and called him back. A few days later I was on a plane to Richmond. I picked up a car for the short drive to the retirement home Porter and his wife, my lovely Aunt Lynn, called home in their late years. The waters of the Chesapeake Bay, where Uncle Porter taught be how to pick up softshell crabs at ebb tide, and the flat countryside once the site of the nearby family farm where he taught me to milk a cow, are nearby. We spent a memorable hour, that afternoon, sharing family stories with all the breath he could muster. That night we had dinner in his room, cut short because his energy was gone, but the next morning he was well enough to join Aunt Lynn and me in the dining room. I would not take all the gold in California for those moments. Two weeks later my husband and I were having breakfast at a London hotel, where we were staying during a long-planned visit. In the International Herald Tribune we read of Uncle Porter’s memorial service in Virginia, attended by fellow farmers and fellow dignitaries, along with a host of friends and all of my family. True to my word I had missed the funeral. But I had lived something better that I would wish for everyone: a goodbye hug and some cherished memories . I look at the picture on my refrigerator, and can imagine Uncle Porter chuckling over the joyful time we snatched from the jaws of death.